MADWOOL IS HAPPY TO HOST CLASSES OF GENERAL INTEREST TO THE COMMUNITY. CHECK HERE FOR OUR OFFERINGS, OR ON THE CALENDAR. Mend and Make Do. With Heather Love of Hello Mello Handspun. *New Date: Sunday, September 22, 2019. 1-3 PM. $40.00. $10.00 deposit holds your space. About Heather: Heather M. Love is a mixed-media artist that lives and works in Brooklyn, NY. She has been a devoted knitter and seamstress since learning from her mother and grandmother at an early age. In 1997, she graduated with a BFA from Tufts University and the School of the Museum of Fine Arts. She has been teaching fine art and crafting workshops since that time. Her label hellomello handspun features handmade knitwear, knitting patterns, hand dyed and hand spun luxury yarns. Stitch a Modern Japanese Rice Pouch. With Karen Stevens. Sunday, November 18, 12-4 PM. $75.00. $25.00 deposit holds your space. Limit 8 students. Karen Stevens returns! Picking up where visible mending left off, now it is time to sew a tote! Once a small patched bag that was used to carry rice offerings to the temple, the Japanese Komebukuro is the perfect bag to carry around your latest knitting project (or anything really!). 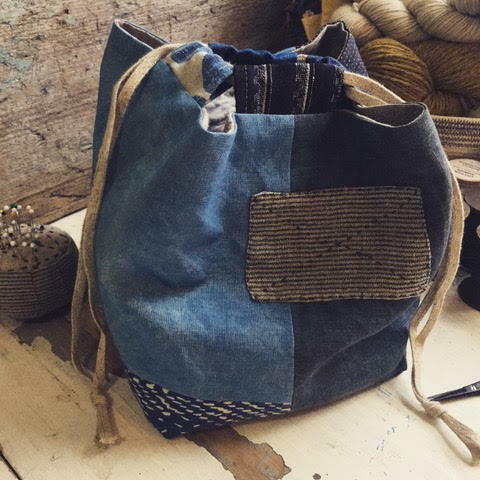 We will use a mix of simple hand stitching and appliqués to create a one of a kind patchwork style drawstring tote. 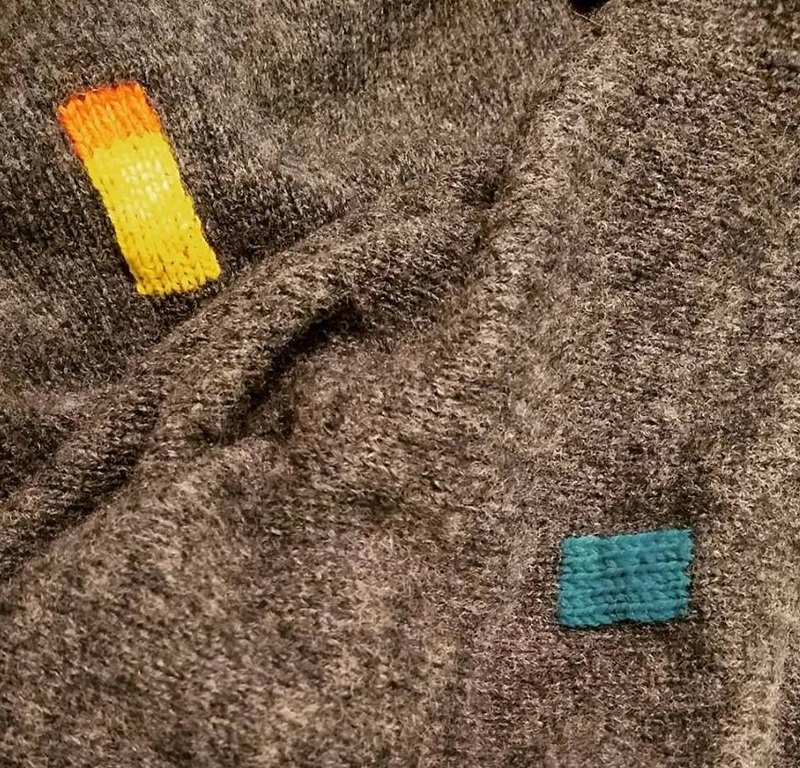 It is even reversible! A perfect project to use up all of your fabric scraps and remnants, and makes a great gift for the holidays as well. Various pieces of scrap fabric for the drawstring tabs and appliqué pieces. Fabric suggestions: Medium weight linen or linen blend (Robert Kaufman Essex linen blend works great! ), quilting cotton, lightweight canvas. I will provide all additional materials. (drawstrings, fabric scraps, embroidery thread and needles) If you have any of these and would like to bring your own, you are welcome! We will have a few machines, but if you have a portable sewing machine you may bring it along also. The bag pattern will be provided. This class is open to beginners, but students who already have a working knowledge of a machine. LOCATION: Lodging- Ioanna House, Warren, VT. (Google for details). Maximum 5 guests. Workshop will be held in a “hobbit” house walking distance from lodging in the Village of Warren. Sunday, March 11, 2018. 10 AM-4:30 PM. $120.00. $60.00 deposit holds your space, remainder of workshop payment due 1 week before. Maximum 12 participants. Open to all experience levels. Lunch break factored in-fridge and microwave available, plus take out available. Tea and snacks provided. This basket is a fiber lover’s dream! You will make a traditional Appalachian style frame basket with a twist– fabric and yarn will be incorporated alongside vines to create a fun and colorful look. We will start with a grapevine frame with god’s eye vines lashing and then use fabric, roving, and yarn to weave the body of the basket, giving it a soft but sturdy construction. There is a lot of room for your individuality to shine in this basket and everyone’s will turn out a different size and shape (approximately 11” x 8” x 10”). Participants will bring their own fabrics, old clothes, roving, and yarn to use in the basket (a selection of material to supplement this will be provided by the instructor and is also available at Madison Wool). Details on what to bring will be included upon sign-up. You will go home with a finished basket, instructions to create many more, and inspiration to continue weaving! Going out into the forests and fields, harvesting materials from nature, and sitting down in the sun to weave a basket is my idea of a perfect day! As an artist my passion is create art with all natural materials that I harvest and prepare from the beautiful landscape around my home. As an educator I guide adults and children alike in connecting to their creative self through the combination of art and nature. I have a background in Fibers Art from Tyler School of Art in Philadelphia and a BFA in Printmaking from SUNY New Paltz and I currently exhibit work regionally in galleries and teach nature and art workshops throughout the Hudson Valley. Self Care for the Fiber Artist. With Jackie Gargano, LMT. Sunday, January 7, 2018. 2:00-3:30 PM. $25.00. $10.00 deposit holds your space. *Limit=6 students. During knitting, crochet and spinning projects our hands, arms, necks and even legs can become numb, cramped and fatigued. In this self care class we will go over different stretches, tips, and massage techniques to help relieve some of these issues. A hand out will be given, as well as complimentary hand and neck massage for each person. Jackie Gargano, Licensed Massage Therapist, is the owner of Generations Massage Therapy (www.generationsmassagetherapy.com) in Madison, CT. Jackie has been an LMT since 2006, and is trained in various methods and techniques. She has worked in both clinical settings and at spas & resorts. In her free time she also knits, crochets and spins. She understands the body mechanics involved in various fiber arts and is happy to help your hands stay healthy and productive! Introduction to Zentangle. With Bernadette and Pilar Gonzalez. Sunday, June 26, 2016. 4-6 PM. $40.00 includes all instruction and materials. $10.00 deposit holds your space. This two-hour workshop is an introduction to the Zentangle method. Zentangle is an easy to learn, meditative art form that helps calm the mind, body and spirit as well as helping you discover the artist in you. This class will cover the history, applications and steps to create an original Zentangle tile. You will be provided with all the materials you will need to create your own paper tile using the patterns we will teach you. The class requires no artistic experience, when you follow the steps we teach you this intuitive art form will come alive. So, If you can hold a pen, want to learn to do something fun, stimulate your creativity, make something beautiful, improve your focus, relax and let go of stress then Zentangle is for you! !